West Sussex Police have opened their new local police base at Selsey Town Council. Selsey Town Council were pleased to welcome the creation of a Sussex Police Base within the Town Hall Complex this week. During consultations on our current business plan 92% of those responding wanted to keep a police presence in the town and through this partnership, the Council has supported the wishes of the community we serve. 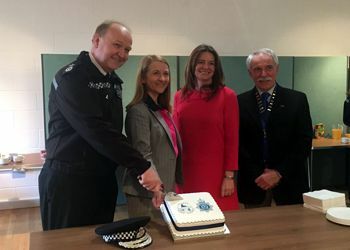 The official opening took place on Friday 2nd February and was attended by Sussex PCC, Katy Bourne, Chief Constable Giles York and MP for Chichester Gillian Keegan, along with Town, District and County councillors, the Community Warden and representatives from local schools & youth organisations. It was really positive to see all these people coming together to celebrate Selsey's new police hub!